As a part of my 2017 goal to blog more personally, I have decided to both a “Mom Confessions” series as well as “Cece’s Favorite Thing!” The mom confessions will be new mom tricks/handy advice I have learned along the way, while Cece’s series will feature some of her favorite toys/products. And, of course, cute pictures of her! I thought in light of the March for Women yesterday, I’d share some of Cece’s favorite books with you, along with links to purchase them on amazon. They aren’t your run of the mill Princess or fairy tale themed books – these are books with a purpose, perfect for unique baby shower gifts! I even know a few adults that have copies of these in their offices for inspiration. No shame in that! These are for smart strong girls of any age and I appreciate all the women in my life who made sure these were a part of her library from the very beginning. A is for Activist by Innosonto Nagara. Cece is reading it in the photo above! Its a colorful board book with lots of powerful messages for every letter of the alphabet. 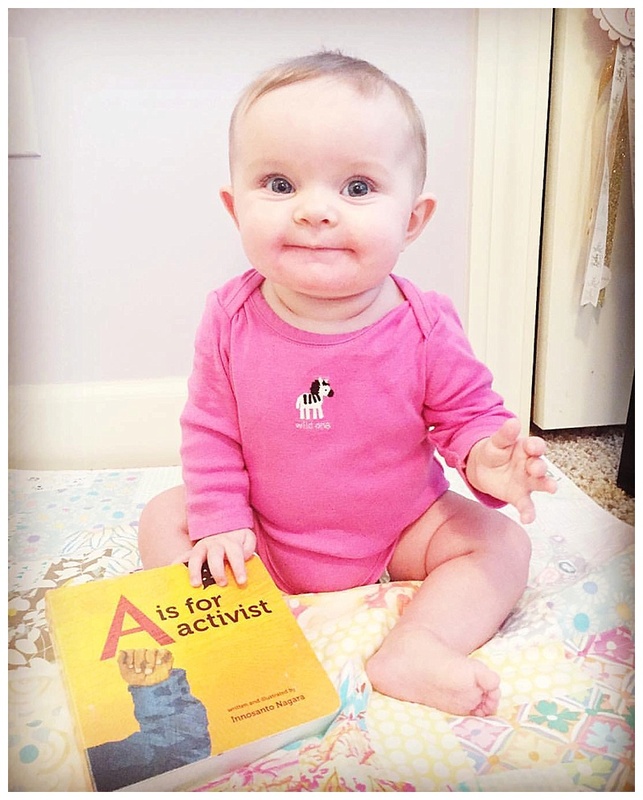 “A is for Activist. Advocate and ally. Actively answering a call to action.” LOVE IT! I Dissent: Ruth Bader Ginsburg Makes Her Mark: by Debbie Levy. Its a picture book about her life, and proves that disagreeing doesn’t make you disagreeable. A message we all could use! Not All Princesses Dress in Pink by Jane Yolen. Teaches us that Princesses come in all different kinds – even ones who like to jump in puddles and climb trees.